IT Blog Awards 2010: Individual IT Professional Male - category information. This category is for blogs that detail an individual perspective, not a company line, of life in the IT industry. Any male blogger working in IT below director level is eligible for this award. Get your badge now. 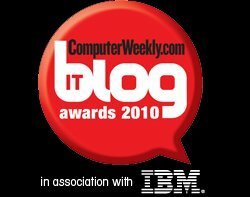 Computer Weekly’s search for the best blogs in IT is now in its third year, and this year’s competition, brought to you in association with IBM, promises to be bigger and better than before. The Awards will reward the best comment and insight that the UK’s IT industry has to offer at an awards ceremony on 18 November at the Delfina. We want to know who you think are the best bloggers and Twitter users in the UK IT industry, so to kick off the Awards we're asking IT professionals to submit their nominations to us. The nominated blogs will be listed on this site, and from all the nominations received we will draw up a shortlist for each category which will then be put back to the public vote. Blogs do not need to originate in the UK, but they must contain some coverage of the UK IT industry. The only exception to this rule is the Best international category. Self-nominations are permitted, but the winners will be decided by a public vote. quality="high" bgcolor="#ffffff" width="120" height="220" name="cw_badge10_IT_pro_male" align="middle"